When an unexpected illness or injury arises, many patients don’t know where to turn. Should they go to the emergency room or try to make an appointment with a general practitioner? 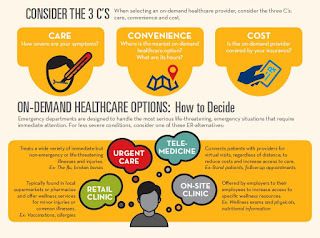 Is the local urgent care the best bet, or should they try a retail clinic or the nurse stationed in their office building? How about telemedicine? The "on-demand" healthcare options are ever growing. That’s why the Urgent Care Association of America (UCAOA) launched a campaign to help educate patients about the various healthcare options available, how much to expect to pay at each and when to go where. To get the conversation started about available options, LCWA and UCAOA worked with mommy bloggers to discuss their healthcare experiences. Posts from Heartfully Heather, Jenn’s Blah Blah Blog, MomStart, Mom Blog Society and Pretty Opinionated helped illuminate what should be considered when choosing a provider. At the same time, national news media are working to educate patients about when to go to urgent care, with many highlighting the differences between urgent care and free-standing emergency rooms, including NBC Nightly News and The Washington Post. We continue working with online influencers and media to educate patients, providing them with information not only about urgent care, but all on-demand healthcare options, so they can make the best choices possible.